We have a very special series of guest posts coming from right here in La Crosse. These series will be a complete breakdown of the kettlebell swing, one of the most highly touted movements for total body work and conditioning. Devan Weis of Journey Active has a level 1 certification through StrongFirst (basically the authority on kettlebell work) and she breaks down how to complete this movement properly. Check it out. This thought is not uncommon, but it is essential we start with a foundation of basics before entertaining the thoughts of complex movement. The kettlebell swing is a complex, arguably full-body movement that is the pinnacle of strength, function, and a great workout. At its core, the kettlebell swing is a hinge. Guess what? So is the deadlift! Boom. You have your reasoning. You should not attempt the kettlebell swing if you don’t first meet the basic standards, progressions, and proper set up. So, what are the basic standards? Hip mobility, a stable core, and flexible hamstrings are essential to the execution of a deadlift. The ability to move through your hips and engage your hamstrings and core appropriately allow you to get the most from your deadlift (and ultimately, your kettlebell swing). Having mobility, flexibility and stability to execute this movement will keep you safe. Injury prevention is a must! If you’re unsure if you should be doing a kettlebell deadlift or swing, ask a qualified professional. I’d be happy to help! 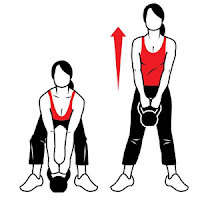 · From the bottom hinge, reach with straight arms down to touch the kettlebell. “Pull the handles apart”. This should engage your lats and set you up for a strong lift. · The part you’ve been waiting for: the lift. From the bottom hinge and ‘lat locked’ position, continue to push through the floor with your feet and lift with your legs, standing tall at the top of the motion. · From the top ‘tall’ position, slowly sit the hips back, keeping the back flat, shoulders above the hips, hips above the knees, and all the other points made in the set-up bullet. Perform a few sets of plain-old body weight “hinges” before executing a heavier-weight kettlebell deadlift. This means basically setting up what you would do with a weight, without actually picking up the weight. Focus on creating tension through the floor and your lats and, as you lift, breathing out all the way to the top ‘tall’ position. Core should be thoroughly engaged at the top. slow. This is not a powerlifting move. Focus on your breathing, your total body tension (have I said that yet? ), and your hinge positioning from bottom to top. Strong On! Enjoy the Journey of your kettlebell deadlift. Let me know how it goes & if this was helpful by contacting me at info@journeyactive.com.